Professor Gutierrez holds a Doctorate (c) in Educational Sciences and Masters degree in Education Management, Pontificia Universidad Católica del Perú. She also holds a Masters degree in Linguistics and another Masters in Social Management, Pontificia Universidad Católica del Perú. She holds an undergraduate degree in Education with a major in Language and Literature from Pontificia Universidad Católica del Perú. Professor Gutierrez has been a communications consultant and has taught on-campus and online courses related to communications and academic, administrative and managerial writing style in the public and private sectors. 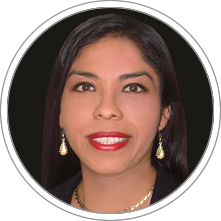 She has worked as a university and precollege program professor and tutor at Pontificia Universidad Católica del Perú, Universidad Peruana Cayetano Heredia, and at other educational institutions. She has been an author and co-author of text books. She currently is a Professor at the Strategy and Leadership department at CENTRUM Católica Graduate Business School.